The last tryout has concluded and now the training camp roster is set. (click here to view training camp roster) The players will continue with their offseason workouts and in a matter of a few weeks they’ll all reconvene back in Johnstown to begin training camp. Three goalies, nine defenseman, and twenty-one forwards, will take the War Memorial ice hoping that come September 13th they’ll be wearing a Tomahawks’ jersey as the team takes the short bus ride to play the Keystone Ice Miners. The coaching staff will have major decisions to make in training camp, just like they did yesterday when they had to take the roster of around 40 players and cut it down to the current camp roster. As Mike Letizia told the Tribune Democrat in this morning’s paper, the team had to part with a lot of great talent, to keep other great talent. One of the most familiar names left off the Johnstown training camp roster was veteran, Forest Donovan. Donovan appeared in 23 games with the Tomahawks’ last season. In those 23 games Donovan registered three points (2 goals, 1 assist) and had a plus one rating. Tender Tristian Ramage was another player that was left off of the training camp roster. Ramage spent three games with the Tomahawks’ last season after being assigned to the Esmark Stars of the NAPHL shortly after the beginning of the season last year. In his three games with the Tomahawks, Ramage didn’t have any points and was an even on the ice. 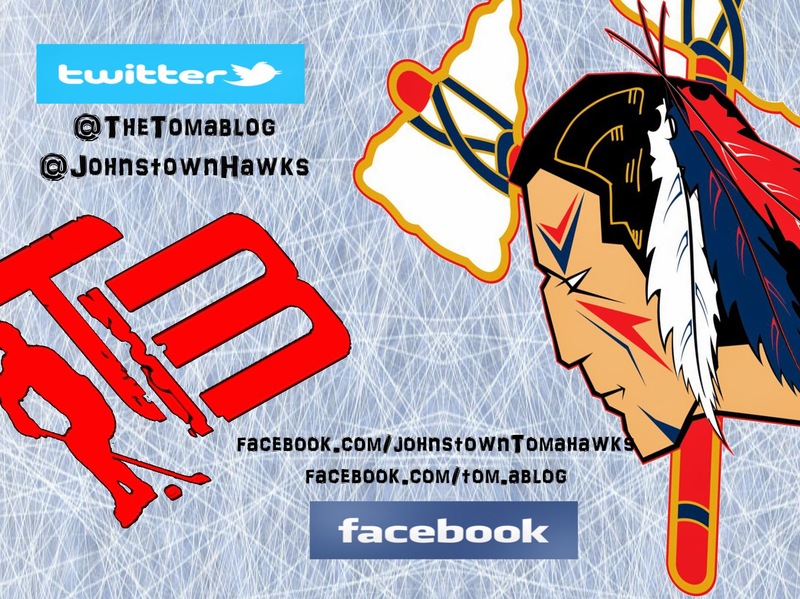 As we’ve said in an earlier post, the Tomahawks are coming into the 2014-2015 season without their top six leading scorers, which means the team will look at other returning players, or new players to fill those holes. During yesterday’s Red vs Blue All-Star game, we saw a few players that might take over the top scoring roles on the Johnstown squad. Tommy Hall scored back-to-back goals and was a thorn in everyone’s side during yesterday’s game. Hall last season played in 29 games for the Tomahawks and had five assists. A year older, and now no longer new to the NAHL game, TheTomablog thinks you’ll be seeing Hall’s name a lot more on the score sheet this upcoming season. Johnstown’s 2014 NAHL first draft pick, Dalton Hunter, also showed exactly what he’s able to provide the team in the scoring department, assisting on team Red’s last two goal. His linemate during the game, Luke Lynch, also had two assists, and showed that the two players already have some good chemistry between them. Zach Zech was also very impressive and coming into training camp is probably the closest to a Shane Bednard type of player as you can get. Dylan Fouts also showed why he was a player that the Tomahawks' tendered during last season. One of the Tomahawks' first tenders of the season, Andrew Romano, played all well during this past weekend. He had two assists in the All-Star game Sunday morning. Romano played last season in the T1EHL U18 for the Philadelphia Jr Flyers U18, scoring 48 points (17 goals, 31 assists) in 36 games. A line that didn't register on the score sheet but played well together was the line of Sanipass, Bates, and Robbins. If the three players continue playing the same way into the regular season, all three should have success in the NAHL and push the Tomahawks further into the playoffs. Ryan Bochert also brings his scoring touch to Johnstown. Bochert comes from the Colorado Rampage U18 team where he was teammates with current Tomahawks' Brady Bender and Zach Geiger. The camp roster has a total of four international players. Returning player, Josh Bowes (Canada), newcomers, Trevor Bush (Canada), Ivan Osko (Slovakia) and Daniel Svoboda (Czech Republic). A NAHL team is allowed to carry a maximum of four international players on their roster. In net the Tomahawks have Brett Young, Jake Gwillim and Ryan Bednard. All three goalies looked very good and in midseason form during their time in net in yesterday’s game. All three goalies stand very tall, literally. Bednard is 6’4, Gwillim is 6’2, and Young is 6’4. This training camp roster for the Tomahawks is hands down the most skilled team they’ve had in their short tenure. We didn’t mention everyone in camp in this article but in the next days and weeks leading up to training camp and the start of the season we hope to provide you with player bios. Till then, let’s go ‘Hawks. Any word on an assistant coach who will work with coach Letizia this year? Team is still in the process of finding the right person for the job. Hear a few names bouncing around but of course nothing official yet. Probably will be in place by training camp.